As the diversity and complexity of work pieces increases, measurement tasks can often no longer be addressed with just one sensor. 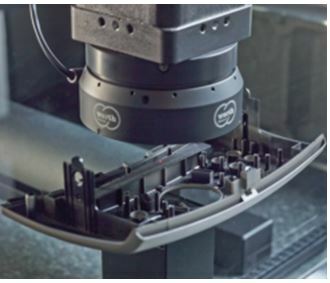 Multisensor coordinate measuring machines are created by integrating various sensors in one measuring machine, each allowing individual adaptation to a specific task. Because all of the sensors measure in the same work piece coordinate system, the measurement results can be linked together in any combination. With the success of image processing, an obvious next step was to integrated such sensors in tactile coordinate measuring machines as an alternative, resulting in multisensor coordinate measuring machines (such as the VP1 video probe system). These solutions were not very successful on the market, however, because the image processing sensors had to be very compact. This placed limitations on the performance and flexibility of the imaging optics and lighting systems. Another approach to multisensor systems equipped the image processing sensor with an integrated laser distance sensor. This was a purely optical multisensor coordinate measuring machine at first, allowing faster 3D measurements than had been possible with the autofocus function of the image processing sensor alone. The use of a combination of optical and tactile electrical sensors was successfully advanced by Werth Messtechnik starting in 1993, as the already established Renishaw probe system was integrated in the compact optical VideoCheck® coordinate measuring machines. Soon tactile scanning operation modes made rapid measurements of contours possible with high point density, combined with 2D image processing measurements and laser scanning in 3D.